With the help of the basketball gods, SFA beat VCU on one of the dumbest fouls in NCAA tournament history (you can tell I was on VCU in that game). SFA runs into a tough UCLA team that will be itching to get back into the sweet 16. UCLA handled a tough Tulsa team, and I see UCLA rolling in this game, and ended SFA’s cinderella run. Andrew Wiggins is quietly telling everyone why he should be the #1 pick in the draft, and is single-handedly carrying his Jayhawks with Embiid hurt. He is averaging 28 points in his last four games, and is on an absolute tear. Stanford beat a tough New Mexico team who many had advancing to play the Jayhawks. I see Kansas winning this game, but it won’t be easy without Embiid. Stanford plays tough inside, and could use that to their advantage. Virginia had a scare against #16 Coastal Carolina, but ended up dominating towards the end of the game, and I see them dismantling a low IQ Memphis basketball team. One of the main reasons why I picked George Washington yesterday was because of that reason, so we will see if it pays off the second time. I put Memphis and Cincy into the same category, two teams that are freaks athletically, but if they play a smarter team, I will generally go with that team (unless I am too scared to pull the trigger). I think Virginia hounds Memphis on the defensive end, and then does enough offensively to advance to the sweet 16. North Carolina squeaked by Providence Bryce Cotton’s (barely) and now have a tough match-up against Iowa State. I said that I could either see Iowa State losing in the first round, or making it to the Elite 8, so I will roll with the Cyclones on this one. The Georges Niang hurts the Cyclones bad, which is why I think it will be a closer game then most people think. I think Cyclones squeak by, but if UNC comes to play wouldn’t surprise me if they win. An impressive opening round win for Gonzaga (typical of them), but there 2nd round drought continues as Arizona is an awful matchup for them. Arizona rolled Weber State, and is playing some of there best basketball. 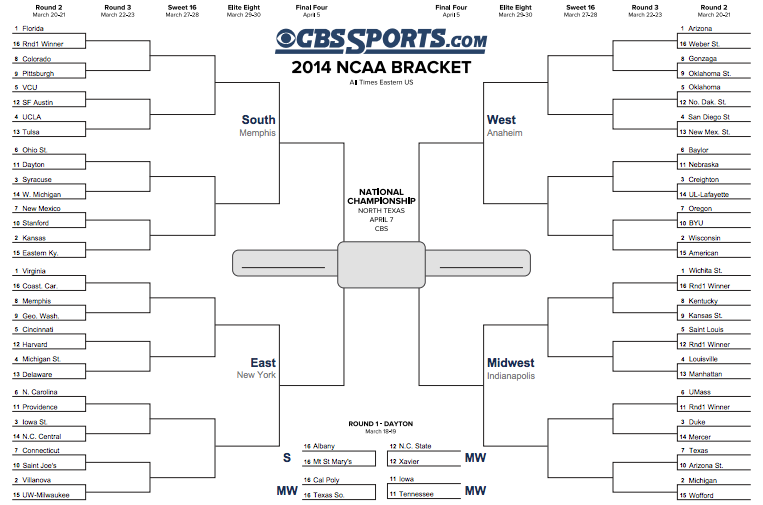 Wildcats have a favorable draw, and will be looking forward to the Sweet 16. 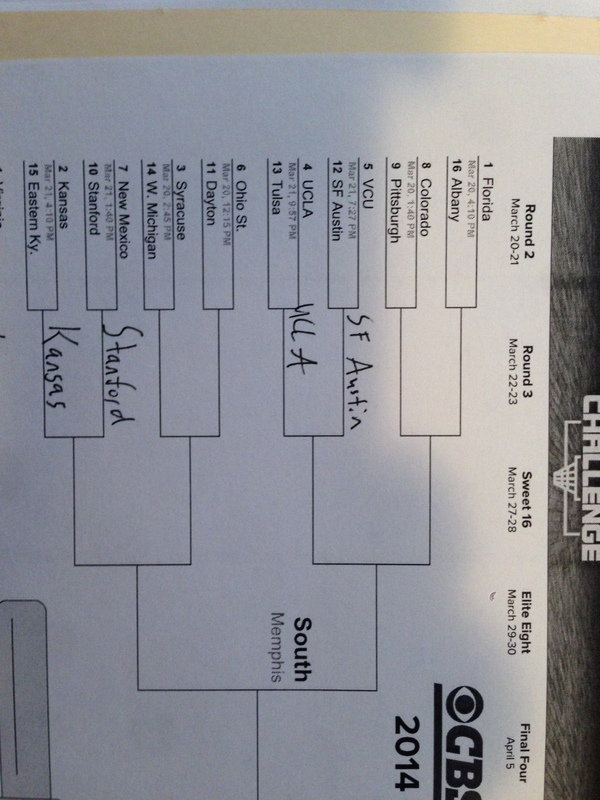 Well, the 6th seeded Bears proved me wrong (should’ve rolled with them like I did in the conference tournament). They have the athletes to beat Creighton, and I am sure Creighton hates to see that they beat Nebraska. Creighton beat a feisty Lafayette team, and will be ready for the Bears. Usually when I am down on a team, they end up winning, so I am going to roll with the team that I am down on, and sorry to all my Baylor Bear friends out there when they lose because of that. Higher on Wichita State than most, I see them as one of the more focused teams in the tournament. They know the odds are against them, they know the committee tried to screw them over with sticking them in the hardest bracket. Trust me, they have heard it all. I see their senior leadership and defense dismantling the young Kentucky team. I like the Shockers in a close on. Knew Tennessee could be dangerous going into the tournament, and now they don’t have to play Duke, but a Mercer team coming off the biggest win in schools history? Tennessee should dominate them inside, and wear them down defensively. This region is setting up for a nice Tennessee run into not only the sweet 16, but farther than that. Tough matchup for SFA, but it is a trendy upset pick within at-least my Texas ties. I guess people have forgotten the VCU I know, which is tenacious defense, fast breaks, and constant pressure on the ball (I saw it first hand when they took out Kansas to go to the Final Four 2 years ago). SFA is on an impressive 27 game winning streak, but if you look at those wins, well, they should win those games. The Southland is one of the weaker conferences in the NCAA (Until ACU becomes a power……..kidding) but VCU with one of the top defenses in the game, should be able to handle them. UCLA is off an impressive Pac-12 tournament championship, which got them this high #4 seed in a favorable bracket for them. UCLA is very efficient on offense, and plays enough defense that they are actually a dark horse in the tournament as a whole. Don’t have many impressive wins, besides a win against Arizona (who wasn’t really playing for much), and Tulsa hasn’t beaten a tournament team all year. UCLA rolls. Tough matchup for a Stanford team that is pretty highly seeded in my opinion. New Mexico drew a tough Harvard team last year (and obviously this year as well), but match up well against Stanford. They are coming off a tough win vs San Diego State, and should be ready to lock down defensively. They are pretty middle of the road as far as tournament teams in offense and defense, and don’t cause many turnovers, but play some of the best defense in the country. Stanford is very big, and if they want a chance to win they need to take advantage of that. Don’t rule out the Embiid-less Jayhawks just yet. Even though Eastern Kentucky does have one of the better shots at taking down a 15 seed than anyone else, I do not see that happening. Kansas still has one of the best players in the country with Andrew Wiggins, and is playing with some motivation after getting knocked out of the Big 12 Tournament earlier than expected. Eastern Kentucky is going to need a lot of help (even though they take some of the best shots in the country), but I think Kansas rolls. Not much to say in this game. 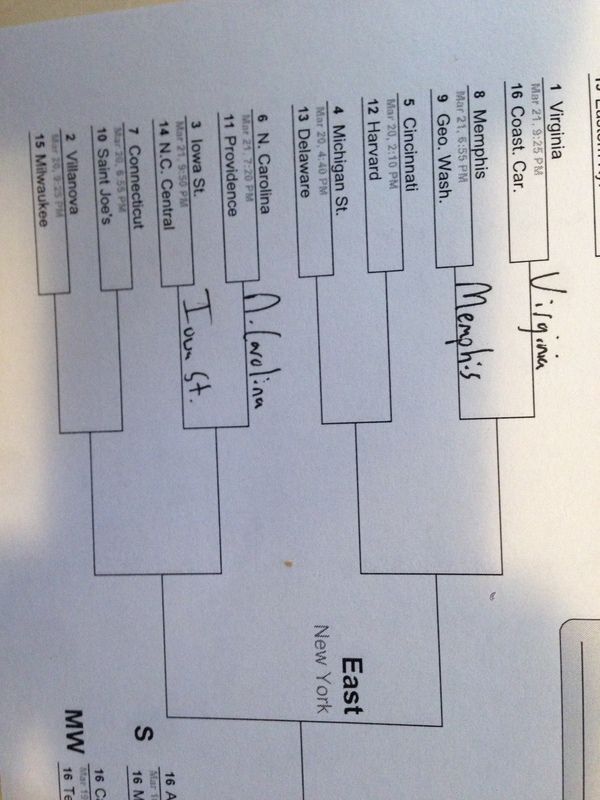 Virginia too deep and solid of a team to give Coastal Carolina a chance. They are one of the worst offensive teams in the country, and given Virginia is one of the best defensive teams in the country, this could be a blood bath. Could be one of the better games of the day. 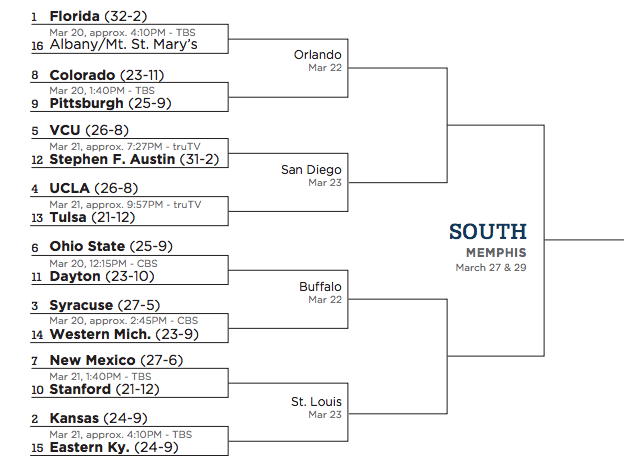 Memphis is coming off a bad loss against Connecticut in the conference tournament, but have some good wins throughout the season. They will be one of the most athletic teams in the tournament, but that doesn’t always lead to victories. George Washington is a fairly under the radar team (I’m guessing most people are just picking Memphis off of the name recognition) but they have a solid team. This is a tough game to call, and could go either way. 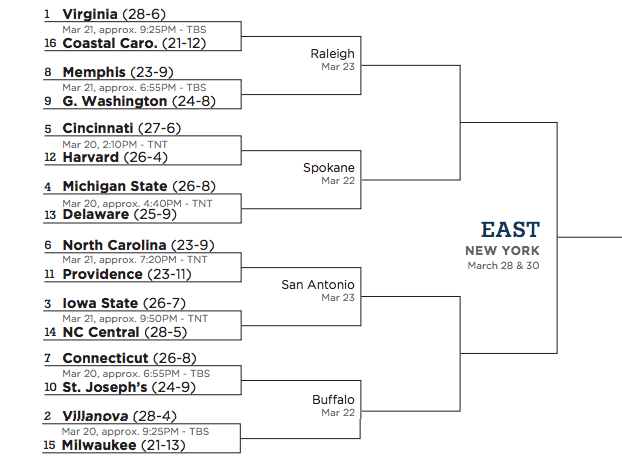 Tough tough matchup for Providence, coming off an impressive run through the Big East tournament. They have some really impressive wins vs tournament teams, so aren’t a shoe in to lose this game. North Carolina started off the season very inconsistent, but got on a hot streak when Mcadoo starting figuring out how to stay out of foul trouble. Back to back losses vs Duke and Pitt should motivate them to come ready to play. If Iowa State thinks they can just sleep walk through this game, then they may be the 3 seed that loses in the first round. N.C. Central is one of the best defensive teams in the country, and that is a big part of their offense. They constantly make teams shoot bad shots, turnover the ball, and play sloppy. Iowa State on the other hand, scores at will, and turned it on during the Big 12 tournament. I could see Iowa State either losing this game, or making it to the Elite 8, that is how dangerous this team is. They are senior led by Kane and Ejim, who may single handedly carry the Cyclones to a first round win. Again, not much to say on this game. Arizona should dominate the Wildcats, and win pretty easily. Weber State is a pretty decent shooting team, but Arizona has the best defense in the nation, so that will cancel anything Weber State tries to do. A potential trap game in my eyes for Oklahoma State. 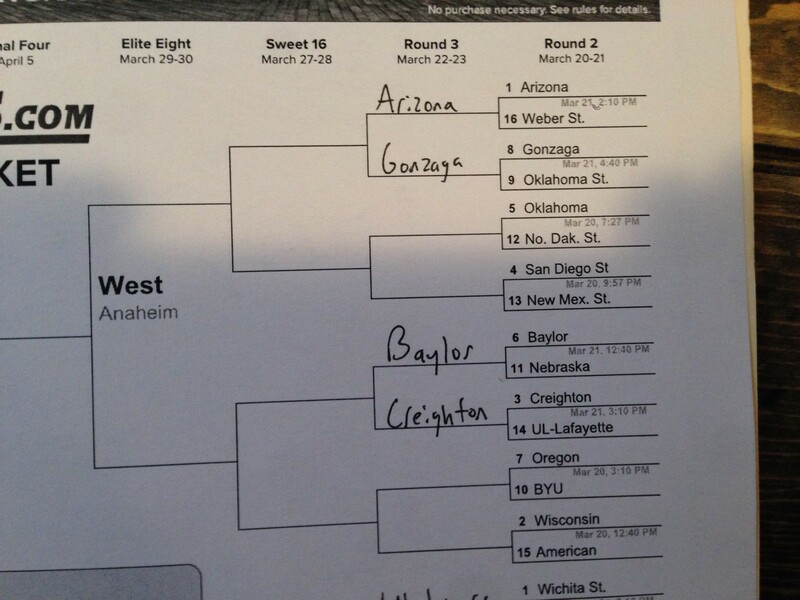 Everyone is expecting them to move on to challenge Arizona, and I am sure Gonzaga has heard all about it. I do like the Cowboys to advance, but this game could be one of the better games of the tournament. Marcus Smart is out to prove a point and show everyone that he is NBA ready, and Le’Bryan Nash is one of the more underrated players in the nation. Gonzaga will have to play as good of defense as they have played all year, and shoot lights out from the field in order to have a chance. Tough game to decide on, keep going back and forth. Baylor is playing some of their best basketball right now, while Nebraska has been one of the more underrated teams all season. How in the world did Baylor get a 6 seed by the way? This matchup to me is all about coaching and who I would rather have leading my team, and that goes to Tim Miles of Nebraska. Scott Drew can recruit with the best of them, but I will pass on him advancing with an under-performing team. Tough draw here for the Sun Belt champions. Creighton is the most efficient offensive teams in the country, and is eager to get back on the court of their loss to Providence. Doug McDermott should have his way and put up his other worldy numbers as the BlueJays roll on to the round of 32. “Wichita State is awful.” “How is Wichita State a 1 seed?” They don’t play anyone.” Well not only have I heard these comments all week, but I can guarantee you they have as well. They should be able to handle Cal Poly easily, and will be looking forward to playing either Kentucky or Kansas State (in which I will guarantee you I will be picking Wichita State). So go ahead and keep betting against them (…until they play Louisville). Battle of the Wildcats, or battle of the under-performing team. I think Kentucky deserved a little bit higher seed, but it didn’t help they played an SEC schedule and had a couple bad losses. Kansas State has been extremely inconsistent all year, and I expect to see that same team in the tournament. The Kentucky freshman may not know how to play in the NCAA tournament, but I believe they get it done, for at least one game. Unfortunately for the people that haven’t followed college basketball all season long, you would probably pick UMass just based off of the much higher seed, but Tennessee is actually a big favorite and should win. They have been extremely under-performing all year, but they can dominate teams at times. One of the best rebounding teams in the country, they wear down teams in the paint, and play suffocating defense. Look for them to be licking their chops at this UMass team, who must have paid someone a lot of money to get a 6 seed……. Not a lot to say about this game, but Mercer is actually a solid team. They are extremely efficient on offense, and have a respectable defense as well. They would have been a live upset pick if they were able to snag a 13-12 seed, but this is an extremely tough matchup verse a Duke team who is on a mission (and who has arguable the best player in the nation in Jabari Parker). 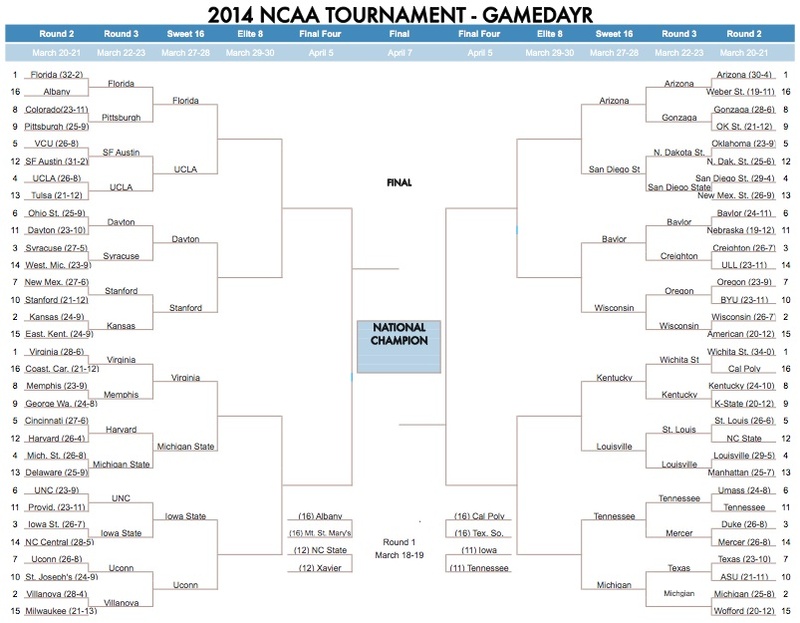 Hope everyone’s brackets have been off to a good start and you haven’t lost anyone too big yet! The time has finally come, and I could not be any more excited to sit on my couch and watch as much basketball as possible. Once again, if you don’t like basketball (or college basketball at least), now is the perfect time to hop on board, I will absolutely welcome it! If you still have a chance to join an office bracket pool, DO IT! It makes the whole tournament a lot more fun. The tournament is pretty up in the air this year, not one team stands out as a clear favorite, so anyone has a chance to win. – Want to actually care who wins the meaningless game of American vs Wisconsin? Join an office pool! – Do you not really like how the NCAA treats its players? Join an office pool to spite them! – Want to have some forced family fun? Make a bracket challenge within your family for bragging rights (my wife and sister in law have won 2 of the last 3 years…..)! Whatever you decide to do, make sure to watch a few games this year. There is always a team that steals peoples hearts, and don’t be afraid to hop on their bandwagon for the month. I have decided to do a small preview of all 67 games this year day by day, along with predictions of who will win the games, and for all of the degenerates out there, my against the spread picks with it (will track my progress to see if I can make it in Vegas or not). 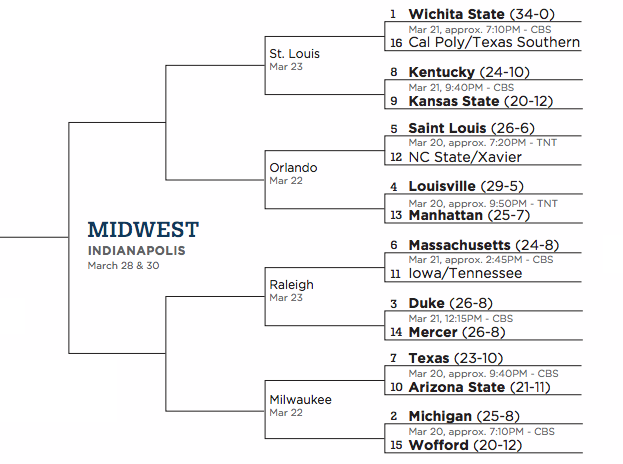 Will go in order of the bracket, so top left (South), bottom left (East), top right (West), bottom right (Midwest). If you want to know more about each team, they each have a hyper link on their name. Not much to say about this game. Florida has dominated the SEC (which I am not sure how impressive that is) but have been by far the most consistent team all year. With a senior loaded team, I will go ahead and say, they will not lose this game. Interesting position for both of these teams. Colorado was pretty mediocre in the Pac-12. Winning the games they should, losing the games they should. They made a decent run in the Pac-12 tournament, so could have some momentum off of that. For them to have a chance, they are going to need to play extremely tough against this Pittsburgh team. Pitt is one of the more underrated teams of the tournament. They hung in in their first year in the ACC. Unfortunately they didn’t win many big games, which gave them this 9 seed and a tough road. They can hang with anyone with the defense they play. One of the more interesting first round matchups, Ohio State has a handful with this Dayton team. A player to watch for Ohio State is LaQuinton Ross. If Ohio State were to make a deep run in this tournament, you will be hearing all about him. Ohio State will be on upset alert for this game, but it will be hard to roll against Thad Matta and the Buckeyes. Buckeyes had the best defense in the Big 10, and we all know, defense wins “championships”, or in this case, a first round game in the NCAA tournament. The MAC champs of Western Michigan are going to have a tough time with Syracuse. Not many people can torch Syracuse’ 2-3 zone, and with Western Michigan not being one of the best 3 point shooting teams, they may struggle. With Syracuse essentially playing a home game in Buffalo, the crowd will be filled with Orange, and I see the Cuse rolling. 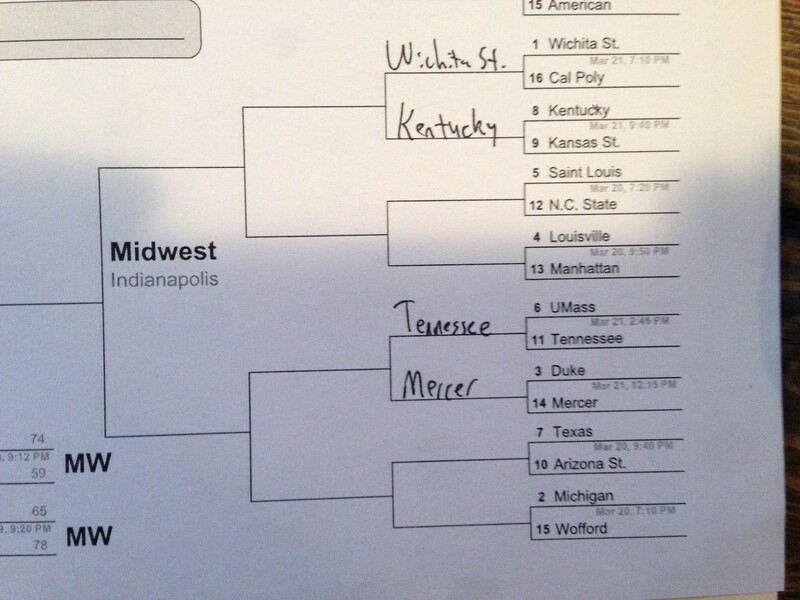 Could potentially be one of the trendiest upset picks of the tournament. Bearcats are coming off a tough loss to Connecticut in the American Athletic Conference tournament. They beat Louisville earlier in the year, but there losses are not all that bad, they are from all tournament teams except for SMU (…..we won’t get into that). With one of my favorite players to watch, Sean Kilpatrick, Cincy will have a tough time with this extremely underrated Harvard team. If it wasn’t for my love of Sean Kilpatrick and me thinking PG’s are one of the most positions in a do or die tournament, I would probably roll with Harvard in this one. Delaware loves to score, but this is an awful match-up for them. If they were put against a slow tempo team they would have a great chance at a first round upset, but Michigan State is playing there best basketball right now, and the seniors on that team will not let them lose this game. Unfortunate draw for the Blue Hens who blew through the Colonial. Saints Joseph’s made an improbable run in the A-10 tournament to get an automatic bid in the tournament, but I think there luck may run out vs a solid Connecticut team. Shabazz Napier is one of the best point guards in the NCAA, and I will role with him verse a tough Saint Joe’s team. As long as Connecticut isn’t playing Louisville (lost to them 3 teams this year) they have been playing solid basketball. I am also a huge Kevin Ollie fan, and like him to coach well in the tournament. If you need to pick an upset, Saint Joseph’s would not be bad to roll with. One of the more underrated teams of the tournament, Villanova was a Big East tournament run a way from snagging a #1 seed from Virginia. One of the most efficient teams on Offense and Defense, they have a great chance to make a run (especially since Creighton isn’t in their side of the bracket). They had a slip up against Seton Hall in the Big East tournament, but I think that just gets them more focused on winning. Milwaukee shouldn’t be much of a problem as they squeaked in the tournament with an automatic bid from the Horizon League. Should be one of the better games on Friday. Oklahoma is coming off a bad loss against Baylor in the Big 12 Tournament, but has played solid during conference play all year. North Dakota State is arguably one of the hottest teams entering the tournament. They are incredibly efficient on offense, and do not make mistakes. This game is going to be close, and as much as I want to take North Dakota State, I just can’t pull the trigger. Would not surprise me at all to see North Dakota State pull this one out for the typical 12-5 upset. San Diego State is one of the tougher teams in the country. With losses to Arizona and New Mexico (and at Wyoming), they don’t have much to hang their heads about. They are one of the top defensive teams in the nation, but sometimes struggle on offense which scares me in the tournament. I am very very tempted to pick New Mexico State here, especially since they did beat New Mexico, at New Mexico, which is something San Diego State has not done, but have to roll with San Diego State. This could be a very, very high scoring and entertaining game. Oregon was one of the hottest teams in the league entering the conference tournament, and stumbled against eventual champion UCLA. Very proficient on offense, and very good at the free throw line, they can be a threat to any team they play. 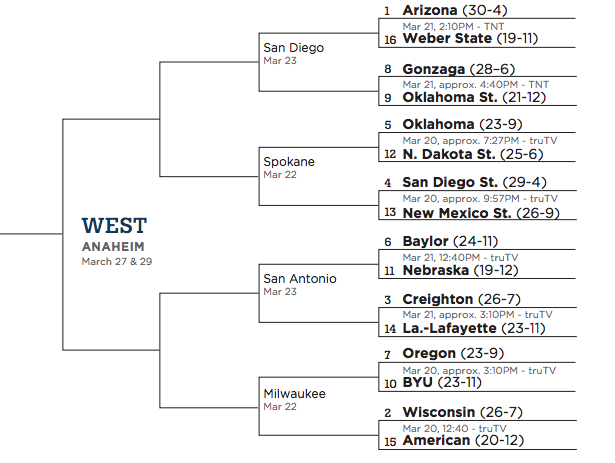 BYU squeaked into the tournament with an at large bid thanks to a nice run in the WCC tournament. These teams played earlier in the year with Oregon winning by 4 in OT. Looking forward to this game as it can go either way. Wisconsin was one of the hottest teams at the beginning of the season, starting off an impressive 16-0 which included wins over Florida, Saint Louis, Virginia, and Milwaukee (and working their way up to a top 3 ranking). This isn’t the same Wisconsin team of years past who is bad come tournament time because of there slow play, they are one of the most efficient offenses in the country and rarely turnover the ball. With a tough loss to Michigan State in the conference tournament, I think they re-focus and make a deep run. Most of you know my opinions about N.C. State getting into the tournament, which basically means they will probably make a deep run in the tournament (which does NOT justify or discredit the selection). They beat Syracuse in the ACC tournament and eventually lost to Duke, which isn’t a bad way to end a season heading into the NCAA tournament. Saint Louis is one of the best defensive teams in the country, but for some reason just don’t have a good feeling about them. Everyone knows how terrible of a seed Louisville got, but it didn’t work out that bad for them. Unfortunately for Manhattan, they got the sour end of it. Manhattan got in winning the MAAC, and though I think they will keep in somewhat respectable, their season will come to an end verse the Cardinals. Louisville is too deep, too good defensively, and Russ Smith will not let them lose this game. Louisville has their eyes on bigger things down the road. One of the trickiest games on the first day (and potential perfect bracket buster) Texas and Arizona State are pretty even. Texas plays in a tougher conference that prepared them for the tournament, and wins verse UNC, Iowa State, Baylor, Kansas, and OSU have not gone unnoticed. Inconsistency has killed both of these teams, especially Arizona State. They don’t have many solid wins, except for a Arizona and if you count Stanford as a good win. They are above average on offense and defense, and the key to this game will be rebounding. Texas has the bigs to beat the Sun Devils, and I think they do (but barely). One of the least talked about top seeds in the tournament, has to be the Wolverines. One of the best teams offensively, who quietly won the big ten regular season title, will look to make a splash this year, just like last year. But unlike last year, with no Trey Burke (we will skip the soap opera of my love for him), I don’t think they have what it takes to make a deep run. They will get by this Wofford team, who got in winning the Southern Conference, but could run into trouble facing Texas or Arizona State. Check back tomorrow for summaries and predictions for the games on Friday.